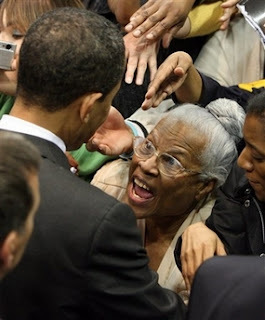 As depicted in this picture, Obama was attacked by a zombie earlier today. Unfortunately, he is already displaying the early cold and flu like symptoms that are commonly associated with a bite from the infected undead. Given Obama's cult like following, the zombie plague will spread rapidly following his public appearances. Readers are advised to exercise extreme caution at these Obama related events, lest they too become infected with the zombie virus. While the U.S. military is reporting a successful missile intercept, we must treat this information with a high level of suspicion. Remember, the U.S. government wants to prevent a panic during the initial stages of the zombie plague. It is likely that Delta Force has already been sent to the site of the outbreak under the guise of securing fissile materials. Hopefully, Delta Force (and the other special forces operatives that will accompany them) will be successful in containing the zombie outbreak. Folks, this is going to be a hell of a fight. May God have mercy on our souls. That's is one hilarious spoof. You say...that...it's...not...a spoof?! And thats why he needs to be president. Still calm and collected in the face of danger!